Reading progress update: I've read XV out of 483 pages. 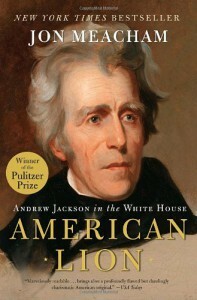 Four hundred and fifty miles down the Atlantic seaboard from Washington, in Charleston, radicals were raising an army to defend South Carolina's right to nullify federal laws it choose not to accept--the first step, Jackson believed, towards secession, and the destruction of the Union. "I expect soon to hear that a civil war of extermination has commenced," said Jackson, musing as he thought of arresting the Southern leaders and hanging them. Well, that sure started out on a positive note.